The Human Torch (Jonathan Lowell Spencer "Johnny" Storm) is a comic book superhero in the Marvel Universe associated with the Fantastic Four. 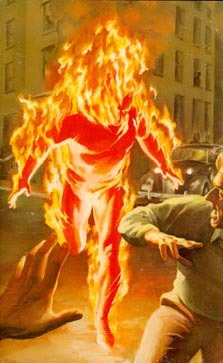 The Human Torch first appeared in Fantastic Four #1 and was created by Stan Lee and Jack Kirby. As a result of the cosmic ray exposure during the space flight he took with his sister, Susan, along with Reed Richards and Ben Grimm, Johnny gained a spectacular set of powers: he can envelop himself in flame at will (often exclaiming his catch-phrase, "Flame on! "), which allows him to fly, shoot flame offensively, and absorb heat energy. Naturally the Torch is invulnerable to his own flame. As the youngest member, he has proved the most impetuous and was given to many of the concerns of teenagers. This includes a teasing (but nonetheless affectionate) relationship with Ben Grimm (The Thing). This hit a low point when Johnny fell in love with Ben's old flame Alicia Masters and married her, only to learn that she was a Skrull impostor named Lyja. The Human Torch is also friends with Spider-Man, who tried to join the Fantastic Four early in his career. The recent "Spider-Man/Human Torch" mini-series by Dan Slott and Ty Templeton explored Johnny and Peter's friendship over the last forty years (though to the characters, it's been ten).